Peppers Bar and Restaurant has an active music programme and is one of the most famous pubs for live music in the country. The area is famed for it's musicians you never know who you might find playing here. 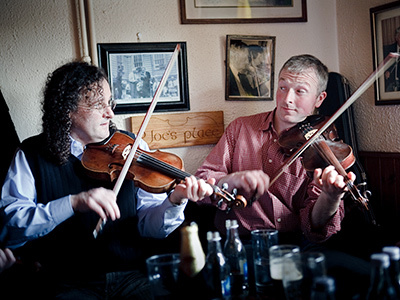 Martin Hayes and Mark Donnellan playing in Pepper's Bar 2009, just as their fathers did (see below). Sessions normally start between 08:30pm and 9:30pm. 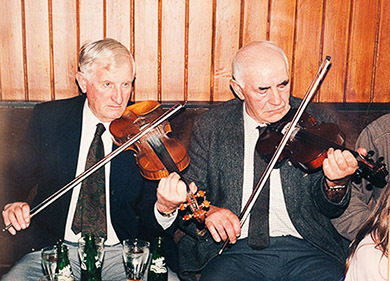 Peppers has a special place for the late P Joe Hayes; renowned as a fiddle player and the long-time leader of the Tulla Céilí Band. Locally, he is best remembered for his generous nature, sense of humour and hard work. 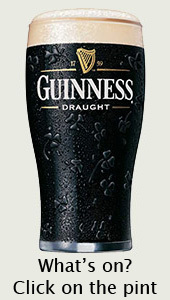 His Wednesday night sessions in Pepper’s Bar were intimate and welcoming. P Joe began learning the fiddle at the age of 11, taught by Pat Canny of Glendree, a near neighbour and father of the fiddler Paddy Canny. 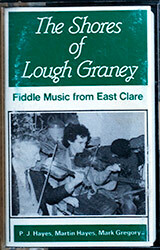 Both P Joe and Paddy were also founder members of the Tulla Céilí Band in 1946. With them in the band then were Theresa Tubridy, Bert McNulty, Aggie White, Jack Murphy, Jim and Paddy Donoghue and Joe Cooley. Seán Reid joined a year later and after, he stepped down in the early 1950s, P Joe took over as leader, a role he held for five decades. The Tulla Céilí Band achieved numerous All-Ireland honours at Fleadh Cheoil, recorded a number of albums, toured America seven times and Britain 14 times, endearing them to countless thousands of Irish exiles. In 1958, they played Carnegie Hall. The band received the keys of the city of Chicago in 1987. In 1947, they recorded for Radió Éireann in Dublin and 50 years later, they were on The Late Late Show. 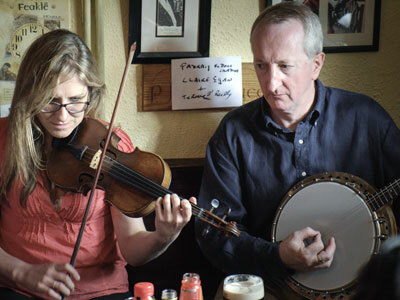 In 1960, P Joe and Paddy Canny recorded an album in Dublin, Irish Champions – Fiddlers, regarded by many as a benchmark LP of traditional Irish music. It was released on the Dublin Records label and accompanying them were flute player Peadar O’Loughlin and Bridie Lafferty on piano. In 1990, he recorded a duet album (only released originally on cassette - now on CD) with son, Martin, entitled The Shores of Lough Graney and has featured on a number of other recordings, including the first Mary McNamara CD. On the Céilí Band’s 50th anniversary in 1996, they played as guests of President Mary Robinson in Áras an Uachtaráin, while the Clare Association in Dublin named P Joe as Clare Person of the Year. Gary recalls, "P Joe was a great man to lead a session. He was a quiet, unassuming man, with a strong personality and he was deeply passionate about music".